In Alfred Hitchcock's "Notorious" (1946), a beautiful new wife (played by Ingrid Bergman) is held captive and is slowly being poisoned to death by her husband because he found out that she is only pretending to be a Nazi. Really, she is a spy and she is actually in love with another spy (Cary Grant). In "Broken Embraces", a beautiful young girlfriend (played by Penelope Cruz) is physically tortured by her old and wealthy boyfriend because he found out that she is only pretending to be a capitalist whore. Really, the woman is an actress and she is in love with a film director. She is starring in a film that is being directed by this love (whom she met while auditioning for the main lead). The film is financed by the old and wealthy boyfriend. And though in “Notorious”, the woman literally couldn’t escape, the woman in “Broken Embraces” chooses not to escape in order to allow the show (the movie) to go on. The obstacles to love in “Broken Embraces” are a little bit more make-believe than in “Notorious”. But this is a wonderful thing - like kids playing a game so enthusiastically that it becomes real. I like that in Almodovar’s movies. It’s not ineffective drama, it is just drama that is its own game and is never required to be in direct relation to the forces that are suggested to have created it. And we know that in this pretend and real creation of romance, Penelope Cruz and the director really do love each other. And it’s real because they decided to make it real. The sad part, though, comes when this brief romance and romance-playing is ended by a car accident that kills the woman. 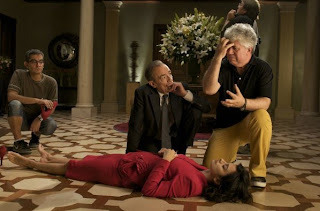 The accident also leaves the director traumatized and blind. This sad part lasts for 14 years. Immediately after the accident, the director abandons his name Mateo Blanco and calls himself Harry Cain. I think the name Harry Cain is a film noir reference, but during the movie, it kept sounding like “hurricane”. I kept thinking "hurricane" while watching a man barely moving and choosing not to live while attentive friends, also not quite living, circle around him. We accept and understand sad and lifeless periods, but we want life at the end, before we go home. What good is the ability to make-believe drama if you can't create it when you need it most? I believe the last act of “Broken Embraces” was an attempt at a happy conclusion – of life reentering the scene for the 3 remaining characters. But all we see is a blind man staring blindly at a film, a lovelorn woman staring lovingly at a blind man, and a taken-for-granted son smiling agreeably at everything. The happiness on their faces makes it seem like something has changed, but their faces are all beaming at something that can’t look back at them - things that they have already been looking at this whole time. And though we had hoped that they were in the process of mending their half-alive selves, we actually see that all of their combined efforts just went into polishing a jewel of the director’s past – restoring the film from 14 years ago that starred the director’s love. We are still in the sad part. When I left the theatre I noticed that I was inappropriately dressed. It would have been great if the movie was contained in 1994, the first year of this long 14 year story. It could have ended with this scene that, as it is, takes place in the middle of the movie: Judith, the long suffering and lovelorn producer picks up the newly blinded director from the site of the tragedy and takes him to the sea with her young son. When it is time to leave and go back to the city, she calls the director’s name and he doesn't respond, she eventually tries his new name - the name, she was told at the hospital, that he now responds to. She calls out “Harry Cain!”. With this, he turns around gleefully towards her voice (the happiest we’ve seen him after the accident, a smile that is real but contains the absurdity of tragedy and games and the ridiculousness and freedom of being someone new) and says “Yes!!? ?” If the movie ended there, we would leave the cinema believing that maybe Harry Cain knew, like we know, that there is much real life to be created with made-up personas and new chapters, even if they start off dark and troubled and in terrible pain. Ingrid Bergman knew it!